Do you wanna promote your brand, product, business or need to create a public identity? Facebook offers you pages feature to represent your business, product, brand, organization or whatsoever publicly and allows you to keep in touch with your fans. Also LinkedIn let your company introduced for millions of LinkedIn professionals via company pages. Lately you might have experiencing changes with Google+ social network and it's features regarding to your private profile. Now Google+ came up with an anticipated feature which is now known as Google+ pages. Didn't you create a Google+ page yet? Google+ page feature enables you to represent your business, product or brand with a whole new approach. Creating a Google+ page will helps you to connect with your fans, customers or followers and also enable them to recommend you online. Like Google+ personal profiles, it allows you to start realtime face-to-face conversations using Hangouts. Also you can edit your posts even after you posted, if it has to be changed without losing all comments and +1s regarding to that post. So you will find it more productive features when you engage with your followers. As Google+ pages connect your customers and followers in a second, further you don't need to promote your business using your private profile. However Google+ still coming up with more professional features for their pages. So if you still unable to find your category or features missing there, just be patient and be alert with upcoming features. Let's get started with Google+ pages. If you looking forward to create Google+ page, you should have a Google+ account for yourself. Create a new Google+ account if you are not a Google+ member. 1. Sign in to your Google+ account. 2. Go to Google+ Page Creation page. 3. Now pick your main category from the left pane to continue. Unless if you couldn't find your specific category, then Other category is for you. Note: If you have selected Local Business or Place, you have to look up for your business or place by entering your phone number. Click Locate button after selecting country and entering your phone number. 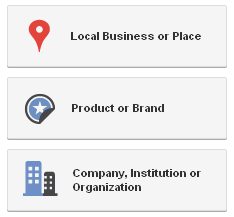 If your business or place not listed on Google, it will prompt you to add your business. If so click Add your business to Google link. 4. Fill up the form with relevant information and make sure to select best suite sub-category for your page. 5. Make sure to agree with Google+ Page Terms. 6. Click on Create button. 7. Now you will prompt to customize your page's public profile by uploading a profile picture and adding tagline which describes your page. Click Next after you done with that. 8. If you would like, you can tell your Google+ friends about your page now. Just add your circles and share on Google+. However you can do this later too. * You can manage your pages at Manage Pages page. Click Manage button to edit or change settings of your page. Else click Delete link to delete your page. * If you wanna post on your page, read How to Post and Comment as Your Page in Google+.